One of the original motives for preparing a neighbourhood plan for the St Quintin and Woodlands area was to breathe some life into Latimer Road. Despite the fact that North Kensington is full of vitality, offering residents a wide choice of interesting places to eat, drink, shop and socialise, Latimer Road in 2012 offered very little in terms of local amenity. 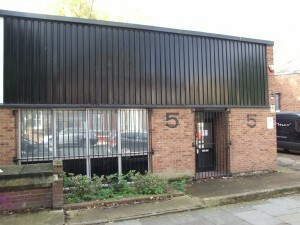 During even minor recessions in the London office market, the office buildings at the southern end of the street fall vacant. Public transport access to the street is poor creating problems for existing employers and employees. 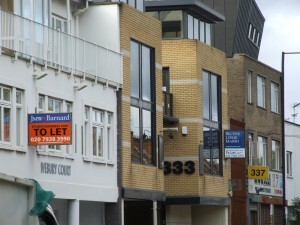 Over the past six years, ‘To Let’ signs have not disappeared on office buildings in Latimer Road. Regrettably their number is increasing once again. In the years since 2012, when a neighbourhood area including Latimer Road was first proposed, there has been some progress (but not yet enough) in revitalising the street. The StQW Neighbourhood Plan includes policies which allow for a wider range of uses in the sections of the street designated by RBKC as an Employment Zone. For Units 1-14 (the light industrial/warehouse buildings) StQW Policy LR1 allows residential use of upper floors in redeveloped B class buildings, provided that the ground floor (and any mezzanine) remains in commercial use. 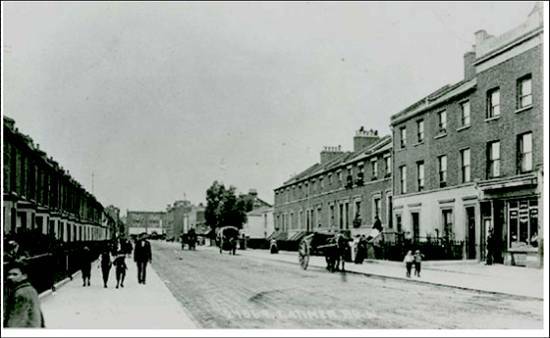 100 years ago, Latimer Road was a busy and valued part of the St Quintin Estate, with shops, pubs, cafes and a mix of housing and business uses. A Latimer Road station on the West London Line provided good public transport access. Laundries were the main commercial activity. The street was what planners would now call ‘mixed use’ with employment activity alongside housing, and the street was more alive as a result. In the 1970s things changed. The arrival of Westway broke up the local street network and Latimer Road ceased to be a through route north/south. The western side of the street (in those days part of Hammersmith) formed part of a Wood Lane Employment Zone. The row of 14 light industrial/warehouse units was built on the western side of the road, facing existing housing on the eastern (Kensington) side of the street.. Following borough boundary changes in 1996, both sides of Latimer Road became part of RBKC. The Council at that time chose to designate four sections of Latimer Road as part of the Freston/Latimer Employment Zone. This meant that any new development in these sections of the street, other than B1 commercial use, was resisted. The StQW Neighbourhood Forum took the view from the start of its life that this ‘zoning’ policy was over-restrictive and had damaged the street over time. Instead of protecting viable commercial space, RBKC planning policies had left too many offices vacant and unused. We also felt strongly that there was scope to provide new housing in Latimer Road, by allowing redevelopment of Units 1-14 with residential above commercial uses (within height limits). The Council did not accept this view, but after hearing evidence from both the Forum and RBKC planning officers at a public hearing in September 2015, the independent examiner of the draft neighbourhood plan sided largely with the StQW Forum. Plans for a pedestrian/cycle underpass beneath the railway line, from the Imperial West site to the southern end of Latimer Road, were announced as far back as 2011. Funding of £4m for this project was secured via a S106 Agreement between Imperial College and LB Hammersmith & Fulham. When built, this underpass will much improve public transport access to Latimer Road, via the Central Line station at White City and the bus routes along Wood Lane. Regrettably, construction of the underpass is a long time coming. The legal agreement with Imperial allows the College to defer the project until the back end of their build programme (halfway completed as at 2016). The most recent date provided for the opening of the underpass is the third quarter of 2019. The StQW Forum continues to meet regularly with Imperial College (and with Westway Trust, owner of the site at 301 Latimer Road) to make discuss progress with the underpass project. It is key to ensuring that Latimer Road retains any viability as an office and employment location, given the arrival of many thousand square metres of purpose built office space in White City East. Mixed use with flats above workshops would address some of the housing needs in the RBKC. This surely must be better than building on the open spaces: backlands of which Nursery Lane is one of only 3 remaining. If the former Volunteer were run properly with good food it would be invaluable to both workers during the day and residents as there is a dearth of places to eat in the fairly large catchment area.